Yes, that crazy card game where the rules keep changing has joined forces with Monty Python to create the Looneyest card game ever! Help King Arthur and his Knights find the Holy Grail. Bring a Shrubbery to the Knights Who Say Ni! Lob the Holy Hand Grenade at the Killer Rabbit with Nasty Big Teeth! Just do it quick, before the Goal changes again! With tons of Holy Grail material, and a healthy smattering of references from Flying Circus and the other movies, this should be a riot for anyone who knows even a little about Monty Python. 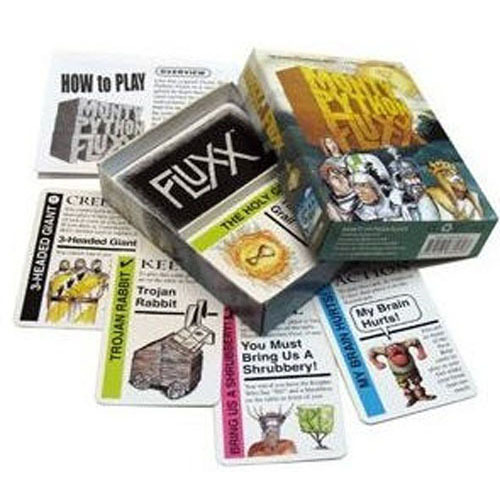 Fluxx is the perfect medium for the show that brought us Something Completely Different at every turn. You know you've always wanted a Castle! ...unfortunately it also comes with a pesky French Knight, who is sure to Taunt you mercilessly. 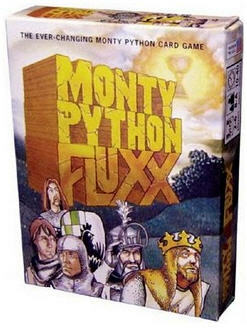 Seven new cards to add to the insanity that is Monty Python Fluxx. This pack comes with a Keeper: The Castle, a Creeper: French Persons, three Goals that use them, as well as the Action: Second Taunting, and the New Rule: We Already Got One!